As owners of Select Total Service we have a very long history in the aerial lift business. Many years ago it seemed very common to see a ladder on the roof of just about every contractor’s truck or van, at this time scissor lifts and booms were very rare. It was around that time that we found employment at a Niagara based company known as Select Equipment. This was a very young company and our role as licensed mechanics was to maintain a small fleet of electric scissors, rough terrain scissors, telescopic booms, forklifts, etc. Before long contractors of all kinds, the manufacturing industry and even the general public relied on aerial lift equipment to speed up their jobs while at the same time keeping their workers safe. Because of the strong service team at Select Equipment we became a service repair shop for every kind of heavy equipment. Repairing forklifts, scissors, booms, carrydeck cranes, bucket trucks, air compressors, welders, golf carts, etc. became second nature. It was easy to see how important service was in running a successful aerial lift company and we grew strong and very close to our customers. As highly trained factory technicians, it was always very easy to keep the rental equipment in top shape and we took great pride in our work. This went on for years and then one day the world as we knew it changed dramatically. Large companies were buying just about every rental house company across North America promising a good future and growth for everyone. Papers were signed and before we knew it our colours changed and we too were working for a very large company. Quickly we realized how little control we actually had at a local branch level and it seemed that the only important factor at the end of each and every day was the bottom dollar. We had been part of a successful aerial lift company with many years experience now being run by people with only a history primarily in waste management. Parts inventory, which was always a very important asset to us now became a large burden as each branch was hit with a monthly 2% surcharge for all items on hand. From head office far away decisions were being made, more and more our hands were being tied. Employees’ hours were cut back and the overall morale was not the same. Getting units out on time and in proper working order was not as important as what it would cost the company in the long run. Outside service work was labeled as “not important” and became an actual problem in the eyes of our new owners. We were all growing very tired of this and the last straw for us was when we received notification which was very clear. Our branch had a very short time to get rid of 9 service technicians and plans were made to close the Thorold branch as soon as possible. Quickly and systematically technicians (real people with real families) were chosen and dismissed. This would leave Niagara and all its valuable customers in search of a good local service shop and quality OEM parts. We decided to take back control of our lives as well as our futures and formed a new company called “Select Total Service”. We registered the name, stayed in Thorold and watched as the competition pulled out of town leaving behind a local phone number to elude all Niagara customers. Right from the start we can remember rebuilding transmissions and servicing equipment all the while building what would be an office and parts room. With a strong commitment, hard work and very long days we dealt with every aspect of running a business. 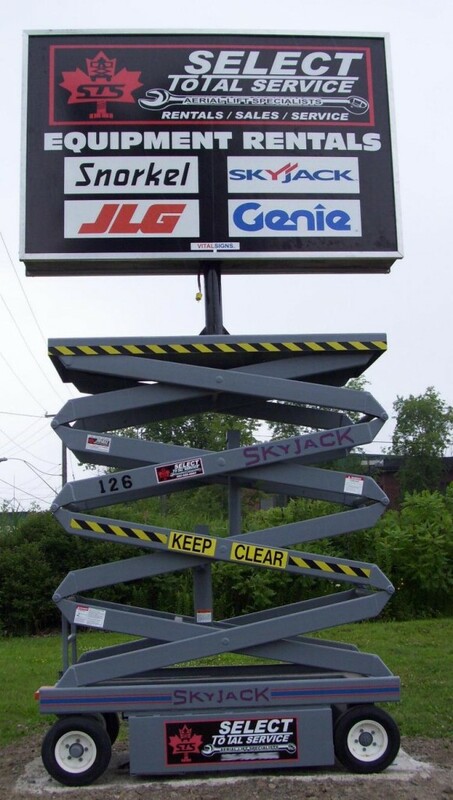 We were very well connected and became a dealer for all the major aerial lift manufacturers such as Skyjack, Omniquip (Snorkel), Genie and JLG. With service as our strong point our company was a great success and it wasn’t long before we bought a fleet of good reliable aerial lift equipment and we moved into a much larger building. This building, located in Thorold had very high work bays, many offices and we thought it had enough land to handle our needs. In just a few years and to our surprise, this building and its property could no longer handle the rapid growth of our company. We then were very lucky to find a very large property which contains a building with even greater potential. This new property has a huge 14,000 sq ft building, and it is situated on a 6 & 1/2 acre lot. The building itself has many offices and also has a very large service repair shop which consists of four large service bay doors for easy access. The building at present is under construction as we need to customize it to meet our aerial lift needs. Presently we have built a new safety training room and our parts room is near complete. Work is still in progress and once we are done with the interior we will begin on the outside. This new location, is just minutes away from Niagara Falls, Welland, Thorold, Port Colborne and St. Catharines, making it a great location for all our customers. Our parts department has a vast inventory of parts and products for many makes and models of scissors, booms, forklifts, heavy trucks, cranes and other industrial and material handling equipment. Today our staff is made up of most of the original Select Equipment team as many have crossed over from our competition. Our staff continues to work very hard and have settled in very well making us proud for having them on board. Select Total Service, which is built on service, has grown strong and we now have a very good hold of our future. With our resources, expertise, and dedicated personal service, we are confident that Select Total Service will be able to meet all of your industrial and material handling equipment, supplies, parts, and service needs. With a large fleet of new and “good” quality used aerial lift equipment of all types we can match the right equipment with the right job and with our trucks can get the equipment delivered on time. Our constantly growing fleet consists of all types of scissor lifts both gas and electric, booms, both articulating and telescopic, forklifts, carrydeck cranes and so on. Keeping a large inventory of parts on hand makes it easy to keep the fleet in great shape and also provides our customers, who have their own maintenance departments, with the same. Our extensive maintenance program ensures that the equipment you as an operator will receive is fully inspected and certified as safe. Nothing is allowed to leave our shop unless it is ready, even the smallest of details are not overlooked. The reality of today and because of our expertise in service, many other rental companies all over Ontario and Canada turn to us for valuable service support and as a parts supplier. Our value and commitment to our customers has never changed and we will continue to lead the way into the future. We wish to take this opportunity to thank all our loyal customers who have stuck with us and helped keep the money here in Ontario where it counts the most. In a world that is always changing it is very comforting to know that you can still deal directly with a person who cares and who will do what it takes to satisfy your needs. Please examine the rest of this site for more information on our products and services, or contact us by fax, phone, or e-mail.